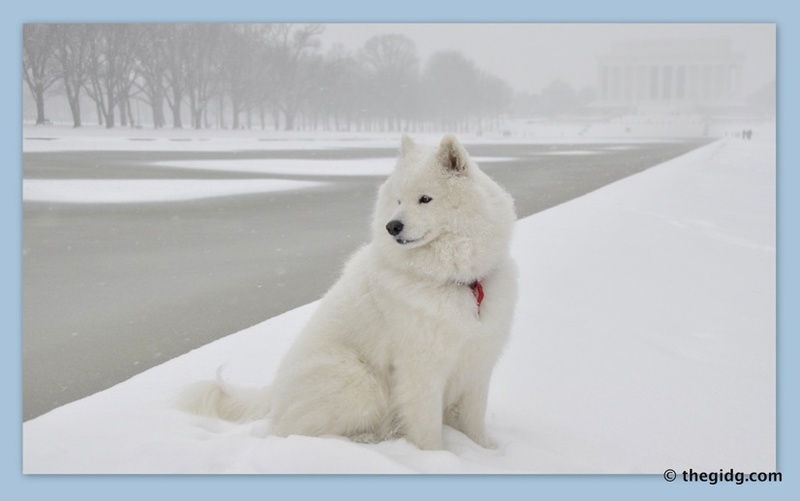 One of the “ancient breeds” identified through study of the canine genome, Samoyeds date back 3000-5000 years ago. 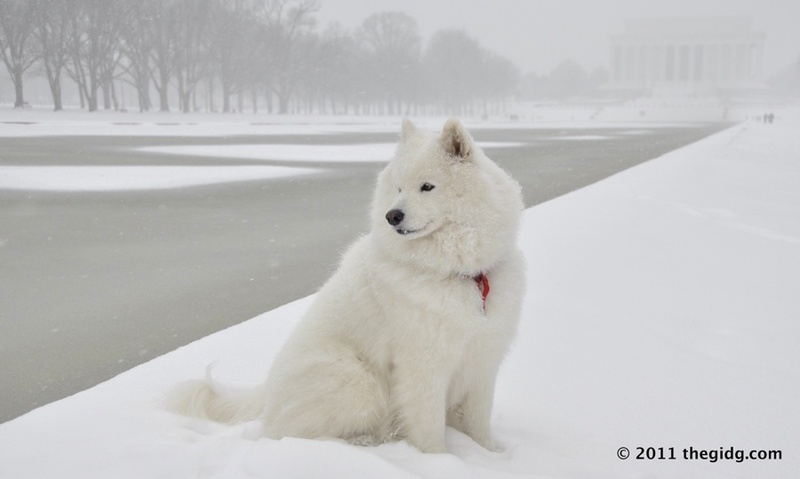 The first Samoyeds arrived in the United States about 100 years ago. According to the American Kennel Club, Samoyeds rank only seventy-sixth in popularity. Yet, the uncommonly dynamic membership of Samoyed clubs coast-to-coast have made the annual Samoyed Club of America National Specialty one of America’s top ten breed shows. In this harsh Arctic environment the Samoyed dogs were utilized to herd reindeer, pull sleds, guard against wolves and bears and keep the tribe’s children warm at night. Their endurance, strength and intelligence made these dogs highly-valued members of early European expeditions to the Arctic and Antarctic. Borchgrevink, Amundsen, and Shackleton in the Antarctic, and Nansen and Abruzzi in the Arctic, counted on Samoyeds to explore the extreme, uncharted ends of the Earth. The American explorers Fiala and Baldwin also used Samoyed sled teams. 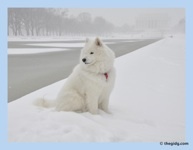 Most of the Samoyeds in England and the United States today are related to sled dogs from those expeditions. Perhaps the most famous Samoyed ever in America was Rex of White Way (1946-57). Also known as “The Blizzard King,” Rex was renowned as the lead dog on the U.S. Mail sled team that used to run the 64-mile mail delivery route from Ashton, Idaho, to West Yellowstone, over the 7000-foot Targhee Pass. Rex was a superb canine athlete and hero, having participated in numerous rescue missions in California’s Sierra Nevada mountains, including retrieving survivors of airplane crashes. Rex was competing in conformation in a San Francisco dog show when word came that he was needed to lead a sled team to the Donner Pass, where a passenger train had been hit by an avalanche and people stranded in cabins needed rescuing. In 1953, Rex of White Way broke the world weight-pull record by pulling 1,870 pounds. This feat made Rex the strongest dog in the world, on a pound-for-pound basis, a record that stood for three decades. Anyone interested in Samoyeds should try to attend the annual Samoyed Club of America National Specialty -- which every year draws several hundred of the top Samoyeds in the nation. The annual specialty takes place in the fall, usually September or October, and they rotate around the country every year. The 2015 National is being held in Louisville, Kentucky. The sight of all those meticulously groomed Samoyeds is stunning. For a non-dog show person like me it is a revelation to see the breeders (from the U.S., Canada and overseas), groomers, handlers and judges hard at work winnowing the field in the myriad competitive classes from puppies to veterans (three categories: ages 8-9, 10-11, 12 and over) and ultimately Best In Show (BIS). The National also features non-conformation events in which Samoyeds excel, including sheep herding, weight-pull, agility and obedience.